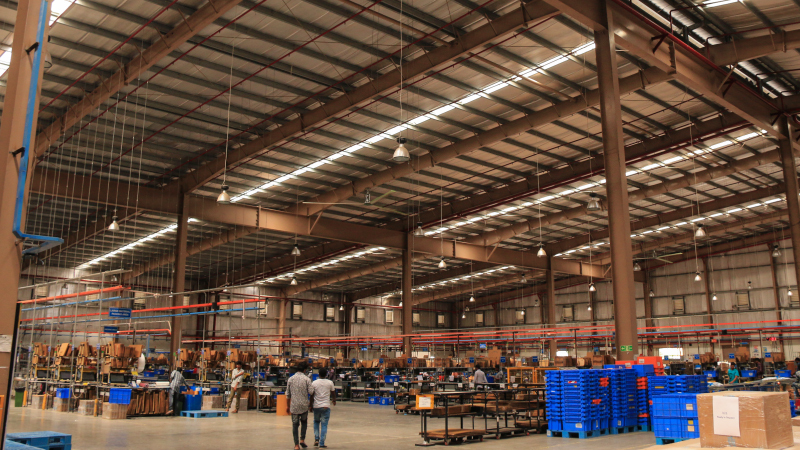 What happens inside India’s happiest warehouse? 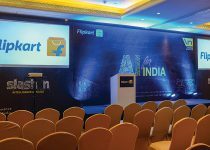 Nestled amid lush fields on the outskirts of the historic city of Hyderabad is one of Flipkart’s largest and busiest warehouses. 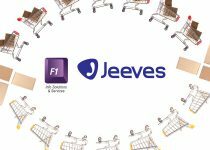 At this state-of-the-art facility, which caters to a large chunk of Indian online shoppers, every second is tested and planned to the minutest detail. Its strength, however, lies as much in its people as it does in the mechanisms. Take a peek into the lives of the people whose aim it is to make sure that all your wishes are fulfilled. Mansa Reddy and Akila Chinnala are inseparable. 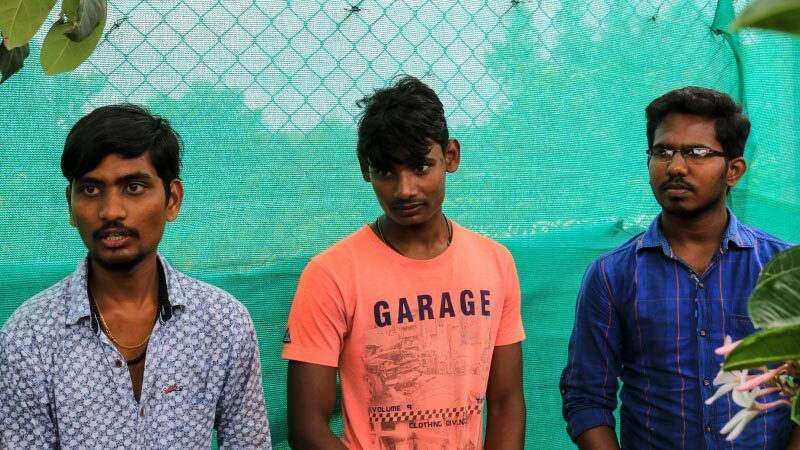 They grew up in a quiet suburb of Hyderabad, Telangana, where their mothers were homemakers and their fathers employed in small industries nearby. They went to the same school and the same college, where they studied computer science. 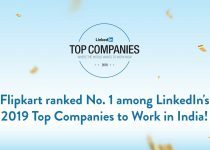 In 2015, they heard about job openings at Flipkart’s Returns Center. “We joined together,” the childhood friends say in unison, grinning as they clasp hands. 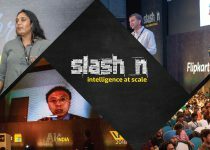 The quiet neighborhood where they grew up is now a bustling industrial hub that has catapulted them into the meshwork of Digital India. 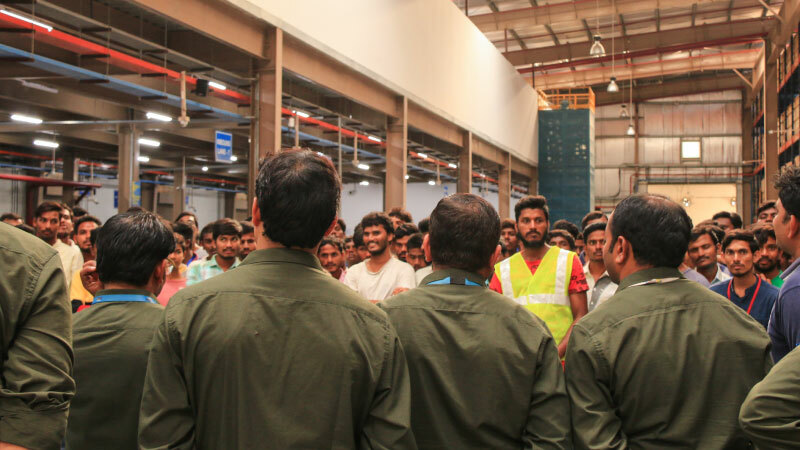 The Flipkart warehouse here employs many of the area’s residents, including women like Mansa and Akila, who are the first in their families to work outside of their homes. 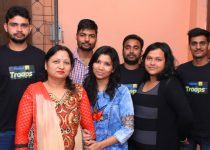 Each morning for the past three years, these young women have boarded the Flipkart employee bus to make the 15-km commute to work. And shop talk has replaced their easy school banter. “I like that there is transport and good security for women here,” says Mansa, dressed for work in a salwar suit, her hair in neat plaits. 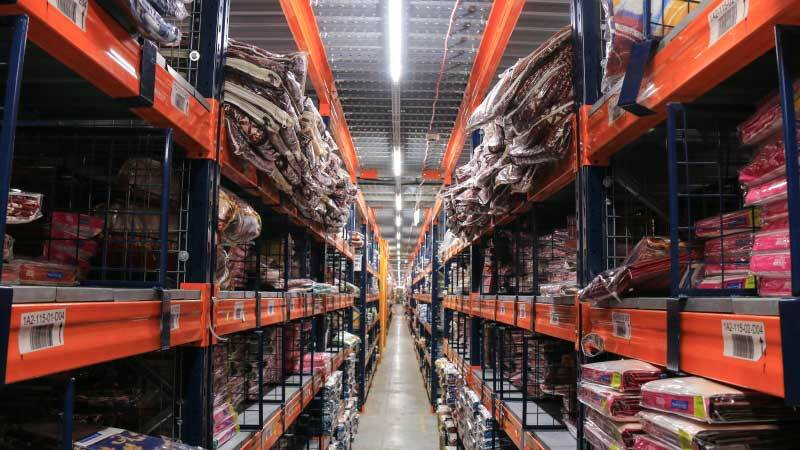 Step Inside India’s Happiest Warehouse! 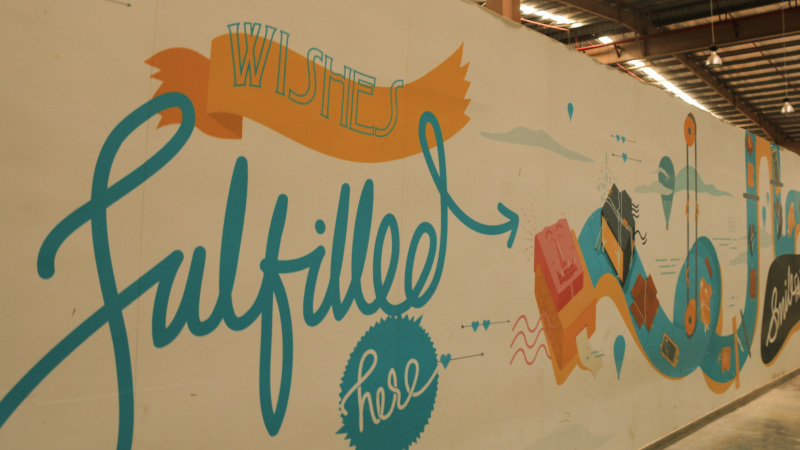 Here’s Some Flipkart Love, From India’s Happiest Warehouse! 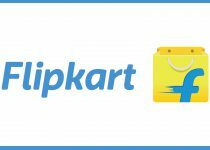 2.2 lakh square feet, over a million products, and cutting-edge technology — the Flipkart warehouse is where the magic happens. But it’s not all machines and mechanisms. 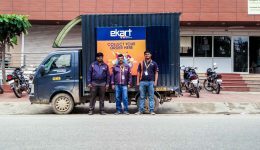 Over 10,000 employees work in shifts, 24 hours a day, 7 days a week to put a smile on your face and get your Flipkart order delivered to you on time. 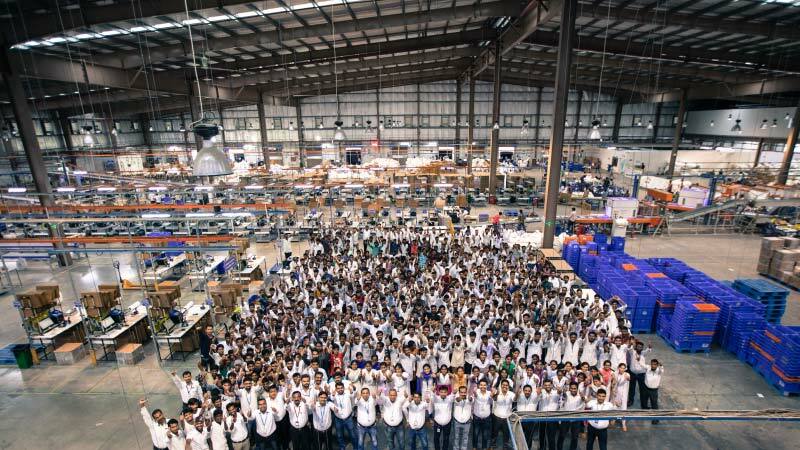 Take a virtual tour of India’s happiest warehouse, and meet the people that make it tick. As the bus makes its way along the narrow road that cuts through green paddy fields, an enormous shed-like structure looms into view. The leafy lanes leading to it are quiet. Buses and trucks dock outside in a neat file. Around 9 am, employees arrive in busloads from in and around the city. It’s Surya Prakash Chintaluri’s first day at work. “We’re freshers,” beams the shy young man, motioning to his four colleagues. They hail from Kakinada, a port city almost 10 hours away from Hyderabad on the eastern coastline. 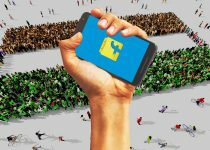 A queue forms as each employee goes through security checkpoints, depositing personal effects like watches and mobiles at the beeping gates, before being ushered into a world in staggering contrast to the lull outside. Thuds of boxes being unloaded, barcode readers pinging, cartons being hauled up metal storeys, loudspeakers shouting out instructions and encouragement simultaneously, the crackle of duct tape, the incessant whirr of conveyor belts. Beeps. Chatter. Laughter. Shouts of jubilation. 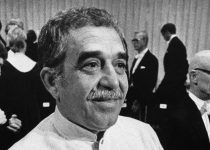 What looks chaotic to the untrained eye is, in fact, a synthesis of precise calculations — each second of every movement, every process, is thought out, tested, and planned to the minutest detail. 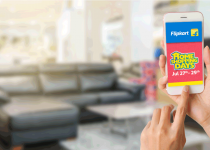 Flipkart’s warehouses serve 22,000 PIN codes across the country. 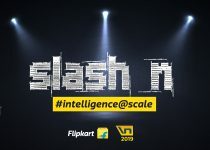 With a floor area of over 2.2 lakh square feet, this state-of-the-art warehouse on the outskirts of Hyderabad is one of Flipkart’s largest and busiest, and also among the first automated warehouses in the country. With a storage capacity of 590,000 cubic feet, it houses over a million products at any given time. Considering the volume of orders the warehouse manages, every fraction of a second counts. 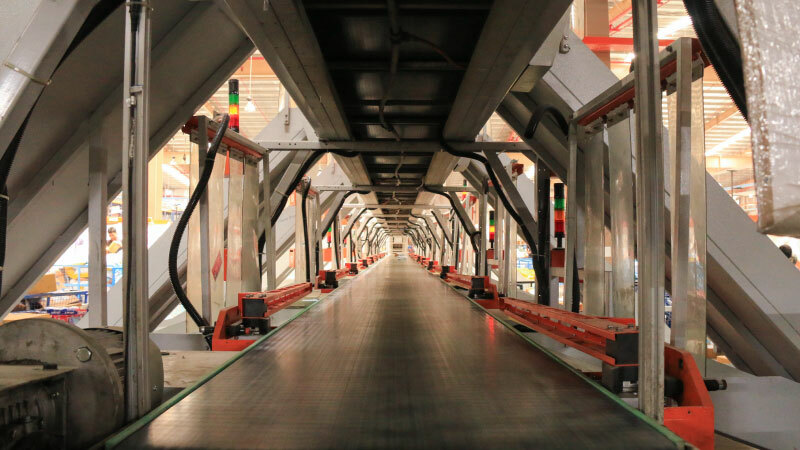 And the latest in technology — IOT-equipped automated conveyor belts, state-of-the-art inventory systems, smart packaging and tracking solutions, among others — helps it race ahead. 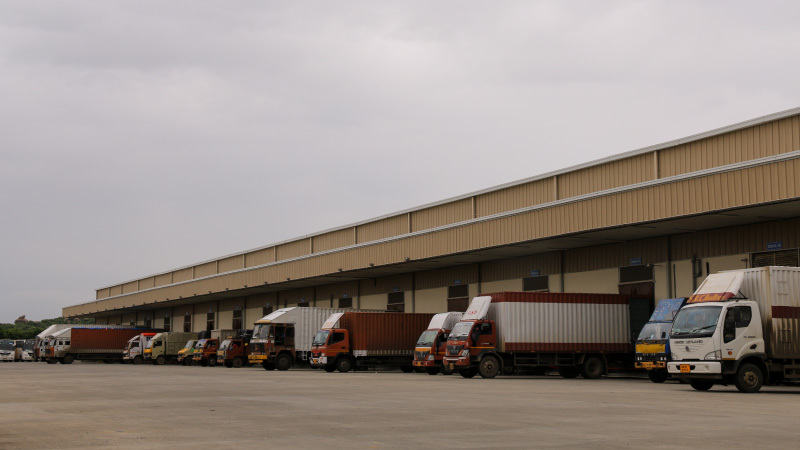 Trucks bring in products from lakhs of vendors across the country. These items are unloaded at docking points that dot the perimeter of the warehouse. Each product is quality-checked, weighed and measured, and then shunted to pre-decided storage spots across the thousands of racks that cover the length and breadth of the warehouse: Books sit in rows, neatly stacked and shrink wrapped. Apparel is individually piled up on separate racks according to item IDs. Cosmetics, perfumes and beauty products are stored in a special, air-conditioned section. 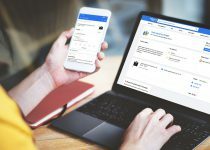 When an order is received, a warehouse system tells employees exactly where even the smallest item is stored, so a ‘picker’ is then able to locate it immediately. 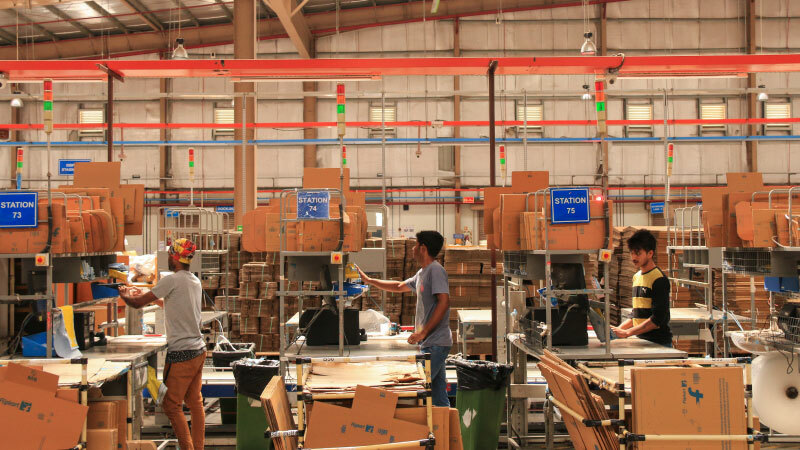 Once located, the item moves to the packaging area, where another quality check takes place. The packed item is placed on an automated conveyor belt, whose robotic arms sort the package based on the destination addresses and PIN code, dropping it off to the accurate bagging area. The item is bagged together with other orders with similar destination addresses, loaded onto trucks, and sent on its way to the awaiting customer. The strength of this well-functioning fulfilment center lies as much in its people as it does in the mechanisms. 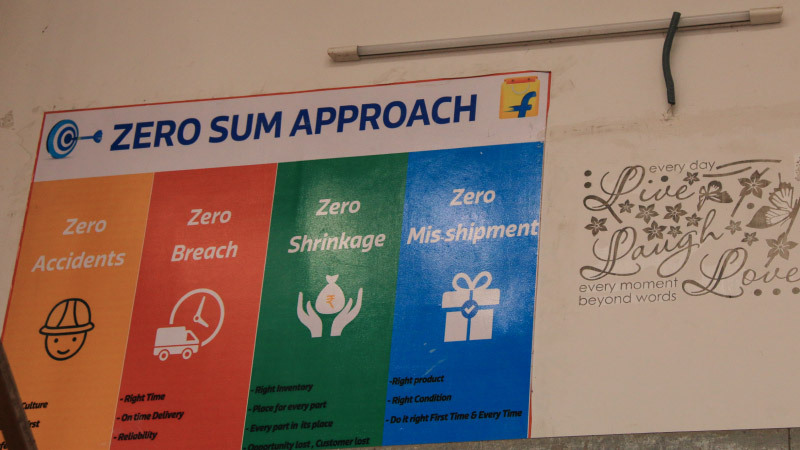 In every corner of the warehouse are telltale signs that accommodate this duality — productivity and safety instructions coexist side-by-side with posters that advocate the importance of the ‘Live, Love, Laugh’ mantra. 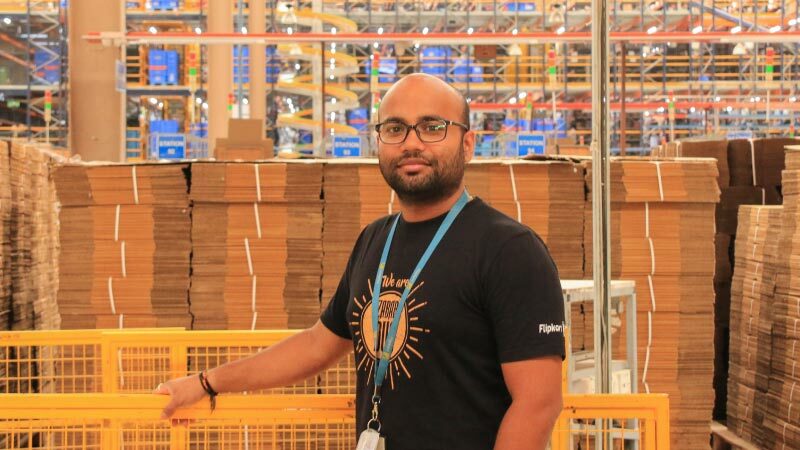 “At our warehouse, our focus is not just processes, but also creating an open environment and nurturing the growth of our employees,” says Anupam Kumar, head of Flipkart’s Fulfilment Center in Hyderabad. 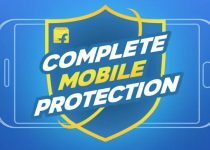 At Flipkart, Anupam is almost as old as the company itself. 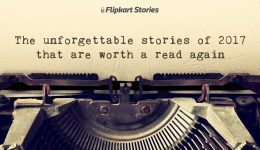 “I joined around the time when Flipkart was known for selling just books and the company had just launched the AV media category” he says, his trained eyes moving rapidly across the busy floor, capturing every frame. 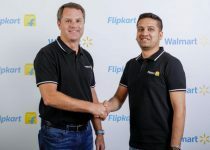 He began eight years ago as an executive, updating every customer order procured in flipkart’s console page, going on to help set up many of the company’s earliest warehouses, and eventually working his way up to heading one of the most crucial ones. 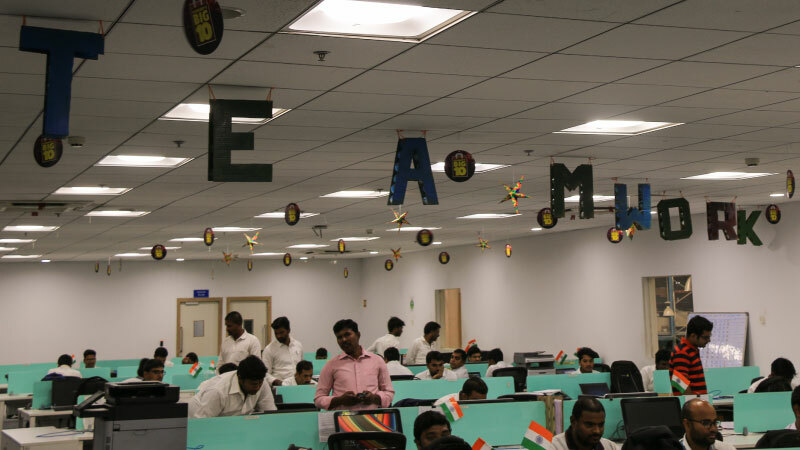 This warehouse functions 24 hours a day, with employees working in shifts, and they share a singular goal — to deliver quality products to every Flipkart customer in the shortest possible time. 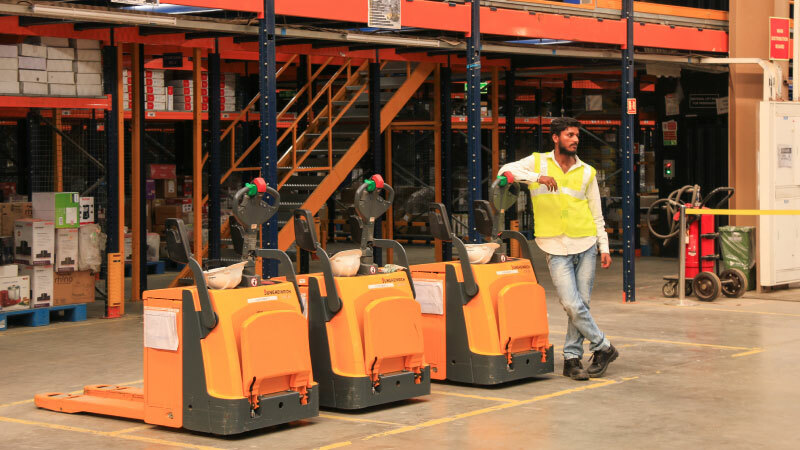 For the warehouse to function at optimum every single day, manpower is key and the planning department stays busy through the year doing just that. 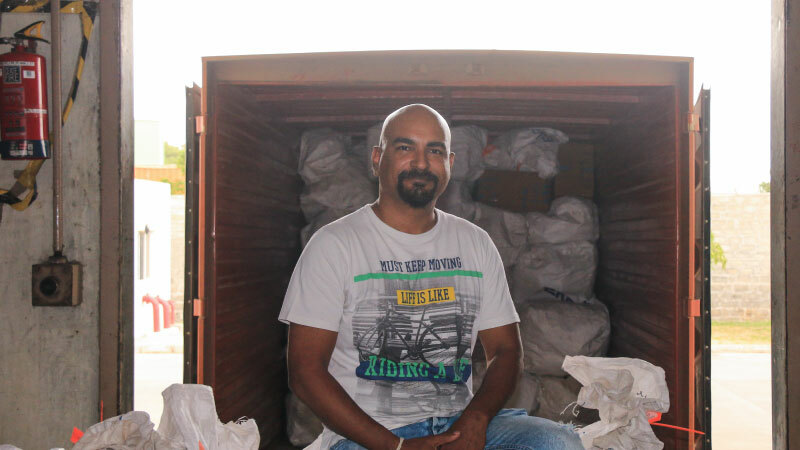 “All the teams tell me what load they are running on and I make sure that they have enough people on ground at any given time to ensure smooth operations,” says Laxman. 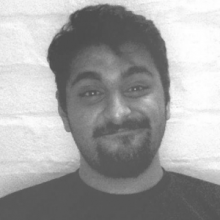 It’s been three years since Laxman joined Flipkart after moving from the UK where he studied and worked. Here, he says, it takes him 40 days to onboard and train employees before they are deemed ready to work on the floor. 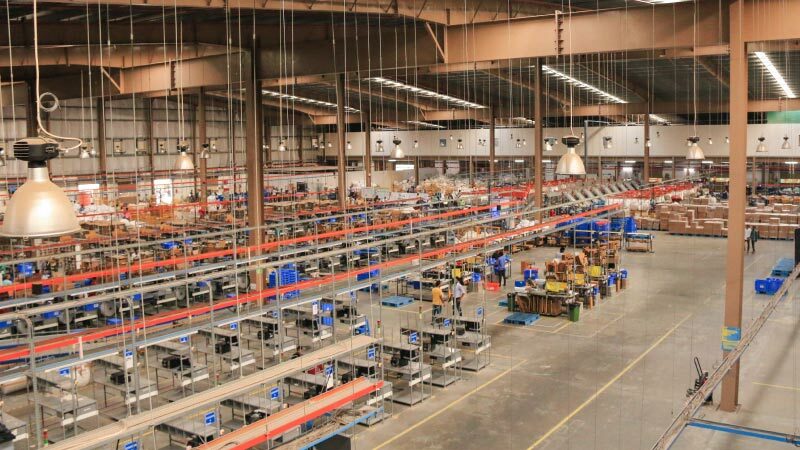 There’s another crucial aspect that’s looked into daily to ensure smooth functioning — space to store the millions of products coming in every day. 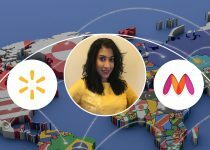 “One of the most critical factors is the daily projection of inbound products,” says Anil Kumar Reddy, Manager – Planning and Inventory. Among the tenets that every employee here internalizes are Customer First, quality, and time. 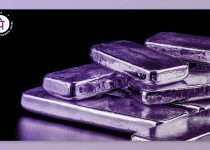 In essence, the aim of every process put in place must translate to customers receiving the right products in mint condition within a promised time. 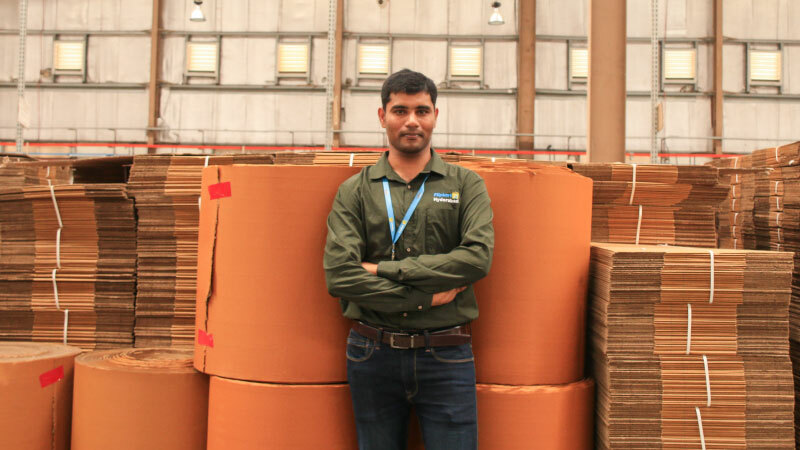 For 25-year-old Nagaraj Kumar, an executive in the outbound packing department, this means almost zen-like concentration during work hours. “We follow the ‘first in, first out’ maxim, which means that products with the earliest delivery dates are prioritized,” he says. When he receives a product, he scans the ID to cross-check the attributes and proceeds to packing only after it’s ascertained that the item is correct and in good condition. Nagaraj mans one of the many packing stations. “Every second counts in this process,” he says. “All of this needs to be done in about 40-45 seconds. 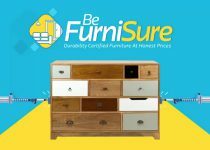 Each of us packs about 75 items in one hour.” A few seconds here or there could delay an entire shipment. 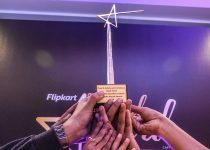 A native of Hyderabad, Nagaraj is often looked up to in the team for having won ‘Best Performer’ twice in just over the two years that he’s been working at Flipkart. Timing is vital every step of the way. 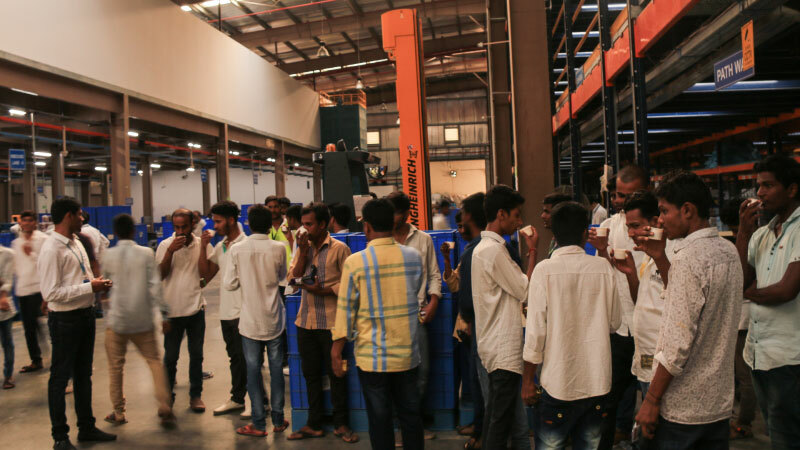 “Every shipment is of utmost importance to us because it’s not just a shipment, there’s a customer who is eagerly waiting at the end of it,” says Raja Srinivas Boddepalli, Territory Manager. 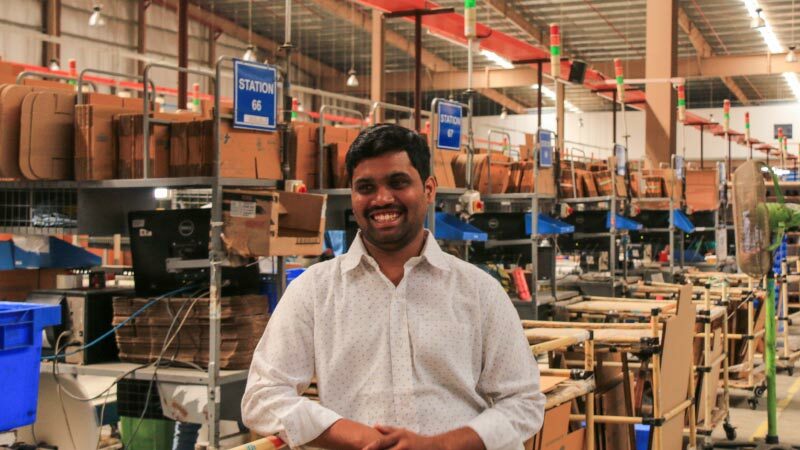 A post-graduate from BITS Pilani, he worked in a Flipkart warehouse in Bangalore before transferring to Hyderabad four years ago. His work entails supervising segregation of over 1,15,000 shipments every day before the slotted cut-off time. For Raja Srinivas, every single shipment is of utmost importance. “It’s not just a shipment, it’s a customer,” he says. 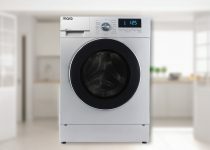 “To meet the customers’ expectations, we are always speeding up our processes. If we don’t meet the Customer Promise Date, a customer is unhappy,” he stresses. 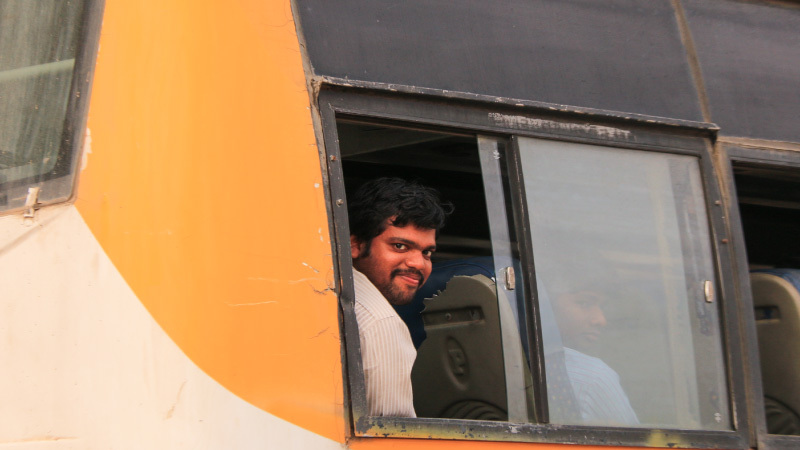 Ramakrishna, Regional Manager for AP and Telangana, Line Haul Operations, seconds this view. Ramakrishna is from the coastal city of Visakhapatnam, over 600 km from Hyderabad. 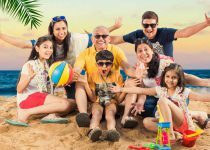 A graduate of IIT-Delhi, he has worked for over 18 years in India, the Middle East and Africa, before moving to Hyderabad to be close to his wife and two kids. 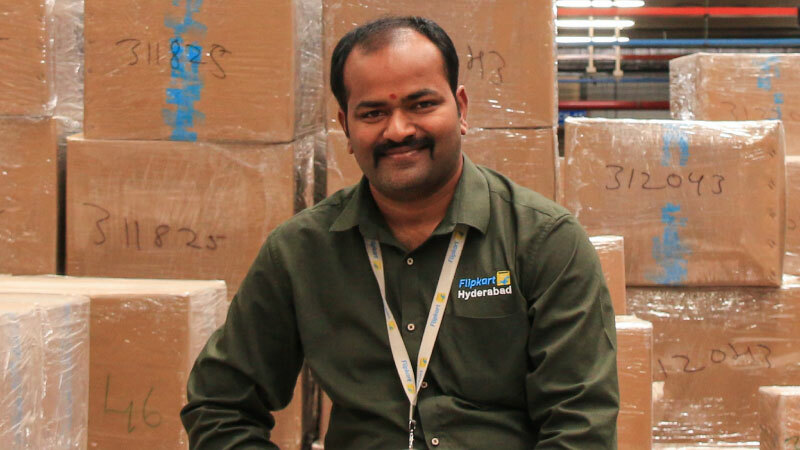 At Flipkart, he’s in charge of ensuring that shipments en route to various hubs are transported and tracked. 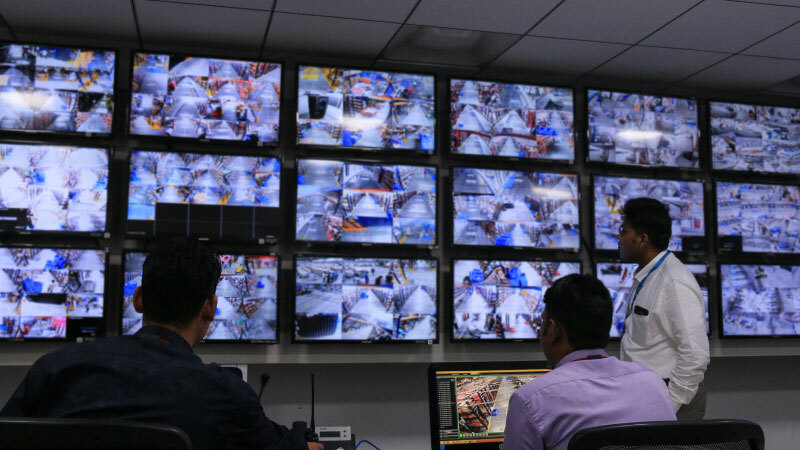 “We do face a lot of challenges, especially if there is a bandh, or a vehicle meets with an accident — it could translate to delayed delivery for a customer,” Ramakrishna says. “But we have back-up for something like that. This also means that we need to be available round the clock — 24 hours a day, holiday or working day, to make sure we meet every deadline,” he emphasizes. 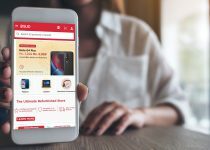 “As far as India is concerned, especially at this moment, there is such high competition,” says Ramakrishna, alluding to the e-commerce industry in India. 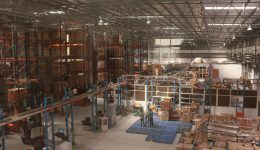 Warehouse jobs are demanding, amid the race to meet tight deadlines with minimal losses. 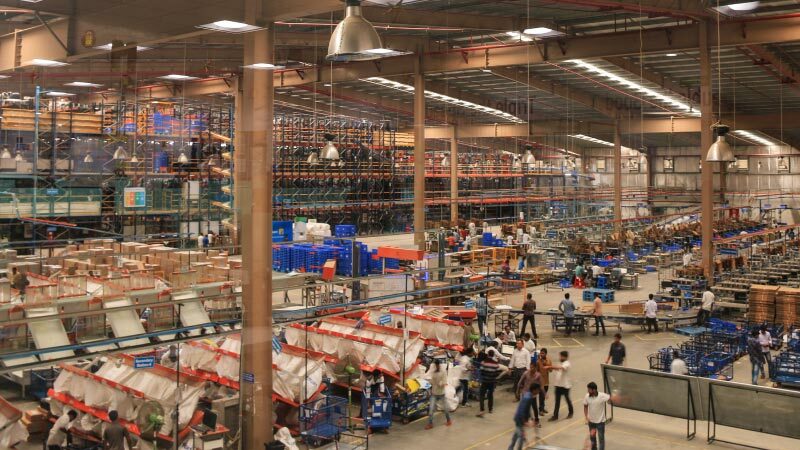 Here, at India’s happiest warehouse, no effort is spared to create and maintain an atmosphere of exhilaration to keep up productivity while ensuring adequate room to de-stress. Across the warehouse, every wall, every notice board is filled with encouraging messages, photographs of award ceremonies and innovation ideas, acknowledging the high stakes and tensions in this line of work. Here, every achievement, big or small, is celebrated. 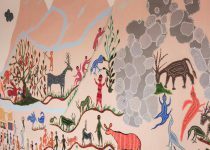 “The kind of environment we have here is not just work, work, work. 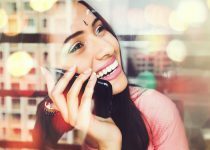 It’s a high-pressure job and people need an outlet as well,” insists Anupam, often stopping to ask someone how they’re doing or check on a process. If there’s anyone who knows the demands of the job and the factors that keep employees motivated, it’s him. There’s another reason for the motivation that drives Anil and his team. 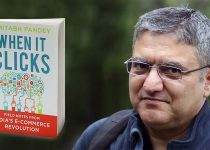 “I have seen that in Flipkart, there is a lot of freedom to come up with ideas and there’s encouragement for us to implement these ideas,” he explains. Right now, he’s excited that one of his suggestions to reduce travel time for ‘pickers’ is in the process of being implemented. 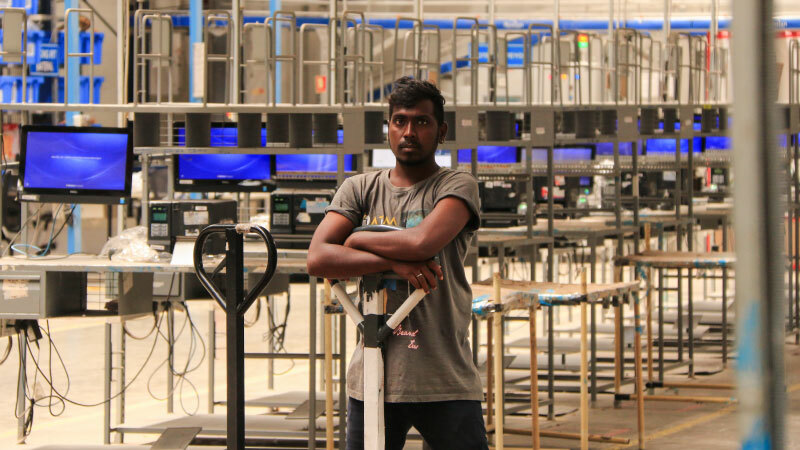 For Nagaraj, it’s the sense of community at the workplace that makes him look forward to coming into work. “I’ve been here over two years and have a lot of friends. During our downtime, we relax and just talk about anything. 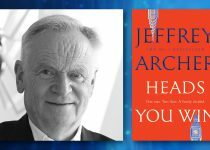 Otherwise, we often do a huddle after our lunch or tea breaks and that helps us get pumped up to get work done,” he says. “I feel like I work with family,” he adds proudly. 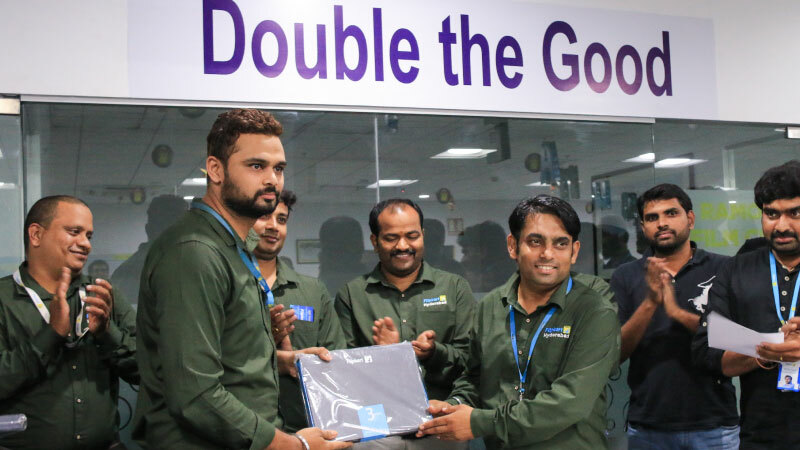 His manager, Satyendra Dubey, who looks after the outbound processes, attests to the power of awards and recognition in motivating his team. “We constantly reward innovation and hold various Kaizen activities to keep our teams driven. And other times, we really celebrate our achievements, especially if it’s something to do with the Big Billion Days sale when the workload is so much higher,” he says. 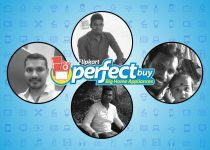 For Laxman from Planning, Flipkart is family in more ways than one. His wife, too, works at the Groceries section nearby. “Talking to her helps me because she understands exactly what I do. We understand each other at another level,” he laughs. 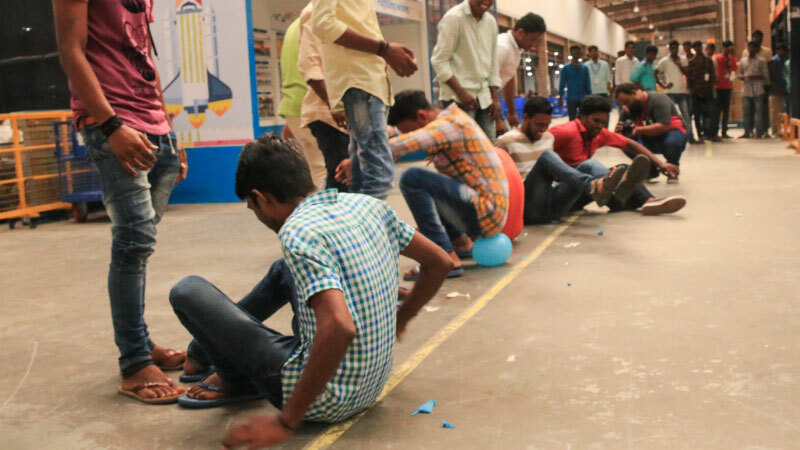 Employees often gather to play kabaddi, volleyball or indoor games to refresh. And once every week, everyone on the floor gets together for a fun quiz and a chance to win goodies for the right answers. 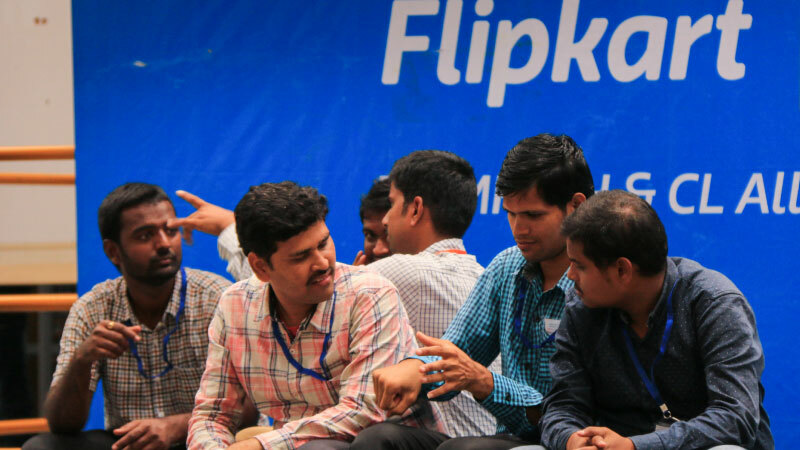 Workforce diversity, too, plays a critical role in defining Flipkart’s culture. Women are employed across roles on the warehouse floor and differently abled employees undergo thorough training to handle specific jobs. For the differently abled employees, many of whom are B Com graduates, training sessions prepare them to join various functions on the floor. B Arun Kumar, who has a hearing and speech impairment, recently finished training and is on his first few days at the packing station. “I’m happy right now,” he signs, communicating through a translator. “I found the process fairly easy and I also enjoy it,” he adds. On his first few days on the floor, Arun exudes confidence — nonchalant, standing with his legs crossed, an arm propped up on one of the shelves as he signs. He often nudges his translator to speed up. 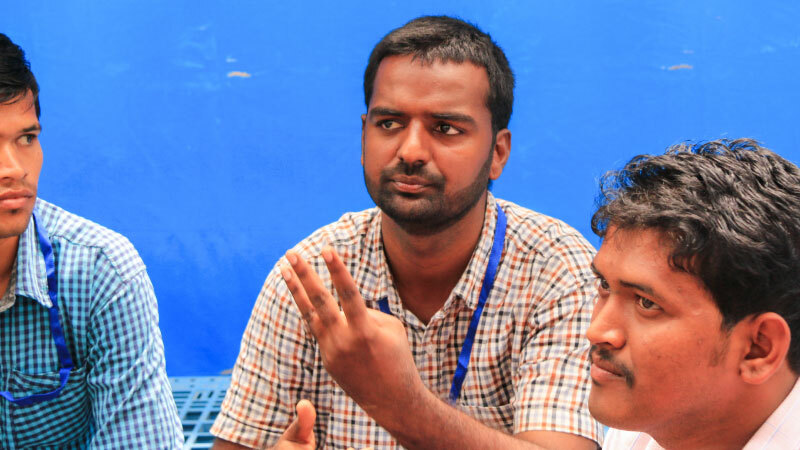 Arun worked in data entry before joining Flipkart and this is his first experience in a warehouse. “My team has been pretty helpful so far and I haven’t had any problems settling in,” he adds. “One of the best things about this place is you get to mingle with so many different people,” says Anupam, who is originally from Ranchi. 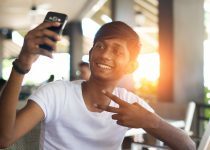 He attributes his time in boarding school for being able to relate to all of his employees, many of whom come from different parts of the country. “Nobody is that different, there’s so much common in all of us,” he reflects. Ask the employees here about their most memorable moment and, almost always, the answer is Big Billion Days. The 2017 one in particular. 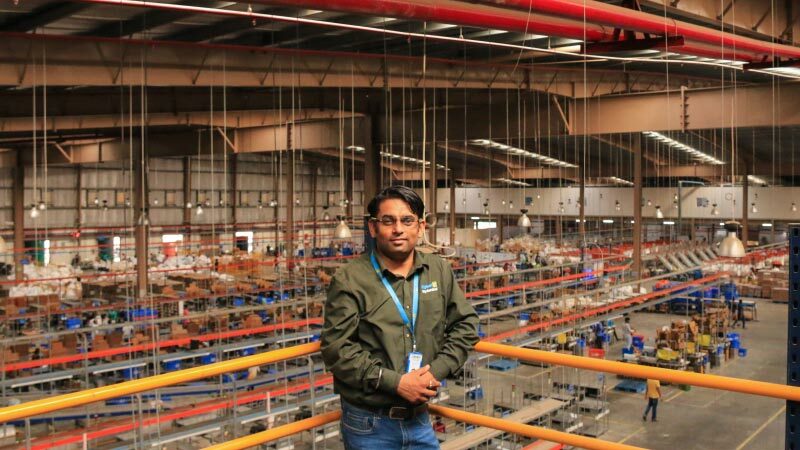 “During the Big Billion Days sale in 2017, we did something fantastic,” says Planning Manager Anil animatedly, adding that his team dispatched over three times the number of orders in a single day. “It was the highest ever and we only incurred single-digit losses,” he grins. “Everyday, I leave for home having learned something new,” he continues animatedly. After his shift, he races home to spend time with his 3-year-old daughter. “That’s the highlight of my day,” he adds, his voice softening. As dusk sets in, employees flock towards the various exits. As they punch out for the day, a new shift of employees begin arriving, pinging through the gates and ready for action. Mansa and Akila walk amidst the crowd, tired but visibly excited to be heading home. “We talk about everything that happens at work on our ride back,” says Akila, laughing. “She’s my confidante,” smiles Mansa, pulling her childhood friend close, arms interlinked as they blend into the crowd.